Shrimp Plant, Justicia brandegeana, is named for the pinkish or orange-ish color of showy bracts that surround its less conspicuous flowers. It often forms a large mass of plants, but dies back to the ground in autumn in cooler parts of its hardiness zone. These photos were submitted by Richard Hagan, a retired meteorologist who lives near Brownsville, Texas. Shrimp Plants grow there all year long. 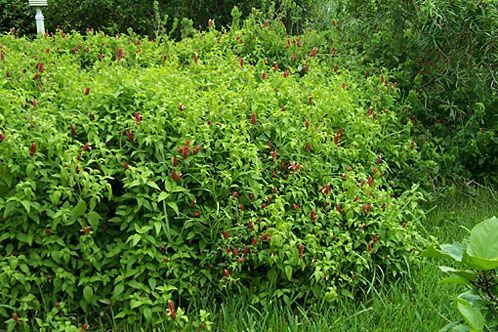 Richard reports that his largest plot of Shrimp Plant covers about 100 square feet (11m sq) and is 4 feet (1.3m) tall in the middle (below). 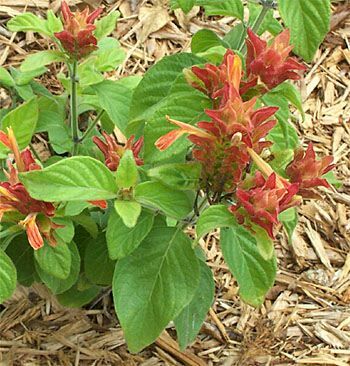 He also highly recommends Texas Firebush, Hamelia patens, to attract hummers.